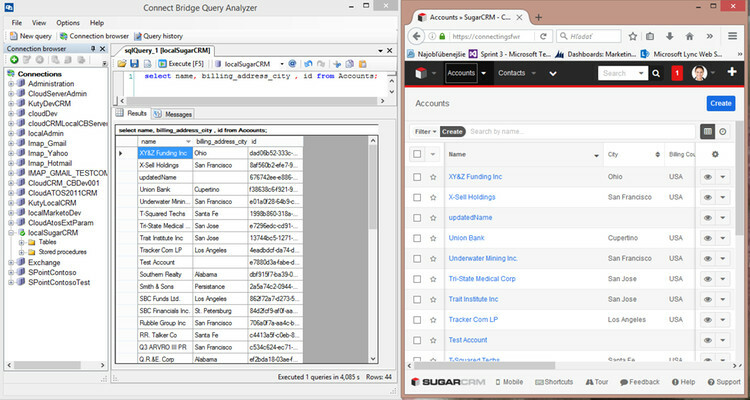 Universal Sugar Integration SugarCRM, Inc.
Connect to Sugar from any major business application with Connect Bridge. Enhance data management by seamlessly integrating Sugar into your company’s infrastructure. Connect all your business systems quickly and efficiently and gain the power to scale. Complete your integration projects faster and speed up time to market with our 30+ connectors. 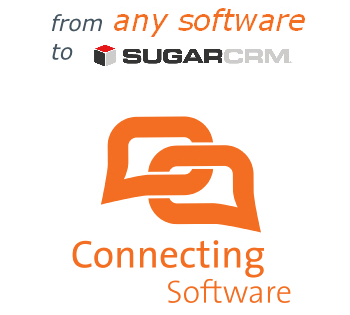 Connect from Sugar to any enterprise business system: CRM, ERP, DMS, CMS, Apps or email. Synchronize workflows with live and bi-directional integration. By integrating Sugar with your various business systems, your sales and marketing teams get on the same page, aligning intra-company communication. See everything in one place: all your customer, marketing, communications, sales data, among others to improve your business processes, campaigns, data management and more. Our integration platform and 30+ connectors are easy to learn and enable fast, reliable integration, customizable to your business needs. Manual data entry requires a large amount of time and effort. Focus on serving your customers rather than typing data and updating databases. Integrate your SugarCRM with any software and ease your everyday workload. Integrate your SugarCRM with any ERP. Synchronize customer database, invoices, stock availability. Build strong relationships with your customers. Provide fast and high quality services. Connect from any ERP including: SAP, Dynamics GP, Dynamics SL, Kronos, Concur, Intacct, Datacor Chempax, PolyPM, Sage ERP, Epicor, Infor, M1, OneSoft Connect, PayTraq, Totvs, Standard ERP, abas ERP, YonYou, iFap ERP 6, Resource Navigator, EasyERP, all others Even easier is the integration is with Dynamics NAV and Dynamics AX. Connecting Software is your reliable integration partner. Connecting Software is a rapid moving business. Not only in terms of number of employees, but also by continuously adding new connectors and expanding the partner network. Your developers can master Connect Bridge in less than two hours. As there is no need to learn or use the APIs of the target systems, you'll see nearly-instant ROI and increased productivity. You decide which Sugar entities to synchronize – our solution supports all the entities – then adapt the live and bi-directional integration to your needs. Connect Bridge translates the ANSI standard SQL syntax into the appropriate API calls, keeping your target system integrity secured while offering you the ease of communicating with any business applications. Integrate Sugar with any ERP system. Synchronize your customer database, invoices, stock availability and build strong relationships with your customers to provide fast and high quality services. Connect to any ERP including: SAP, Dynamics GP, Dynamics SL, Kronos, Concur, Intacct, Datacor Chempax, PolyPM, Sage ERP, Epicor, Infor, M1, OneSoft Connect, PayTraq, Totvs, Standard ERP, abas ERP, YonYou, iFap ERP 6, Resource Navigator, EasyERP, and all others. Integration of Dynamics NAV and Dynamics AX is even easier. Integrate Sugar with any DMS system. Centralize your data management and store your files in one place. Connect from any DMS including: DocPoint, FileHold, Ademero, Onehub, elcomCMS, eFileCabinet, eDoc Organizer, docSTAR, DSpace, Office Gemini, Nuance, SmartFile, filedepot, Asite, SmartVault and all others. Integration with DropBox, lobodms, OneDrive and Google Drive is even easier. Integrate Sugar with any CMS system such as: Joomla, Wordpress, Magento, Drupal, TextPattern, modx, IBM FileNet, ModX, RefineryCMS, Concrete5, DotNetNuke, Umbraco, TinyCMS, Liferay, Google Search Appliance, EMC Documentum, OpenText, Onbase, Newgen Software, Adobe Experience Manager, Nuxeo, SharePoint, Alfresco, Liferay and many more. Keep track of your conversations with customers directly in Sugar. Integrate with IBM Notes, Mail.com, Yandex Mail., Inbox.com, MailChimp, AOL Mail and many more. Integration with Exchange, Gmail, Yahoo Mail, IMAP and Outlook.com is even easier. Empower all-round data management with seamless connectivity of your IT infrastructure. Simplify your internal processes with our out-of-the-box connectors that extend the capabilities of major enterprise systems.